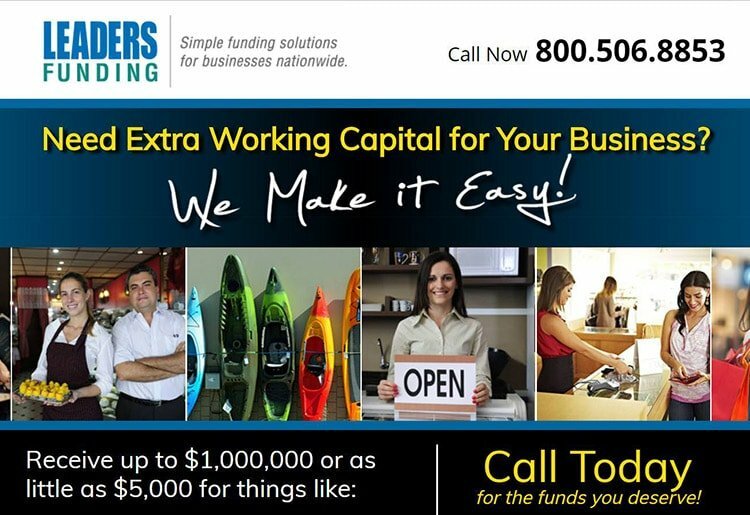 Leaders Funding offers business loans and merchant cash advances to a wide range of businesses. Applying for a standard business loan or merchant cash advance only takes 2 days to find out if you’re approved. Once you decide on a loan, Leaders Funding acts as a go-between to help handle the process and make your experience as smooth as possible. Why Go With Leaders Funding? Leaders Funding offers business loans and merchant cash advances to a wide range of businesses from recent startups to well-established ventures. Companies with reliable cash flow and solid financial projections can apply for business loans up to $1 million and may be able to secure even more funding in some circumstances. When you put in an application with Leaders Funding, they act as a facilitator between you and Wells Fargo, the bank through which their loans are fulfilled. You don’t have to deal directly with any major lenders or worry about a long application process. If you need a smaller amount of funding, applying for a merchant cash advance may provide up to $500,000 to cover expenses. With a two-day turnaround for approval and money delivered in about four days, Leaders Funding provides a fast alternative to common lending options. Knowing how large of a loan you require and what your monthly budget looks like will help you decide which lending option is right for your business. By providing a choice between the structure of a business term loan and the flexibility of a merchant cash advance, Leaders Funding makes it possible for businesses in just about any financial situation to qualify. They don’t ask for a minimum credit score, relying instead on the information provided in the short application to find the best terms and rates for each customer. As with most loan providers, the better your financial standing, the more favorable the terms and rates can be. No restrictions are placed on the money received from either type of loan. You’re free to do whatever you wish to keep your business running through a slow season or support ongoing growth. Payback options also support different financial needs. Business loans offer predictable monthly payments until the interest and principal are paid off. Merchant cash advances are paid using a percentage of each credit card sale. Leaders Funding has options to apply for a loan online or over the phone. If you choose to fill in the online application on the homepage of their site, they should contact you regarding approval within 48 hours. You also have the option to fill in additional comments or questions before submission. No other paperwork is requested up front, so you don’t have to spend time gathering complex financial statements or be concerned about sharing sensitive personal data during the application process. What’s Unique About Leaders Funding? Leaders Funding provides all the information about its loan options and application on a single page. 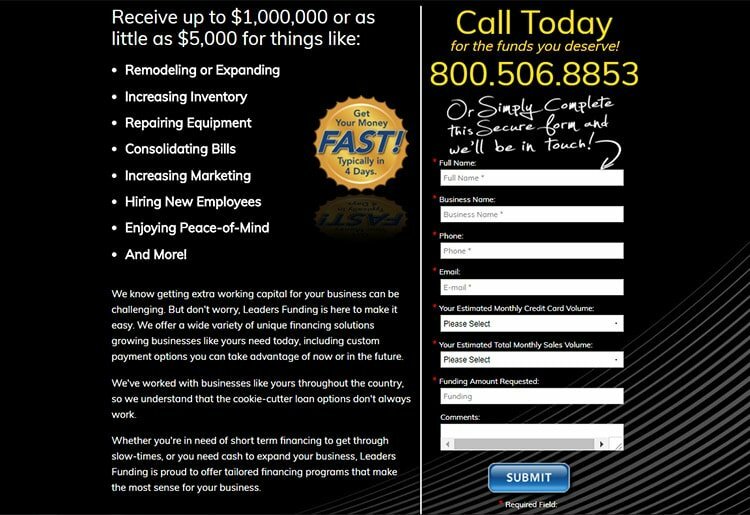 This streamlined approach allows businesses to visit the site, decide on a loan type, and apply in just a few minutes. The application is short, and no detailed personal or business information is required to obtain a quote on either a standard business loan or a merchant cash advance. As part of a suite of services offered by the larger Leaders Merchant Services company, Leaders Funding seeks to provide low rates and favorable terms to qualifying companies. All loans and cash advances are handled through Wells Fargo, so if your application is approved, the money is backed up by a large, well-known lender. However, by choosing this lender, you don’t have to go through the same kind of application process required by traditional lenders. The company handles both applications and approvals. You choose whether or not to accept the terms of the loan for which you qualify. Applying for a loan takes minutes, and you should be approved within two days if your business qualifies. If you have an established business, you may be able to obtain funding of $1 million or more through a standard loan. 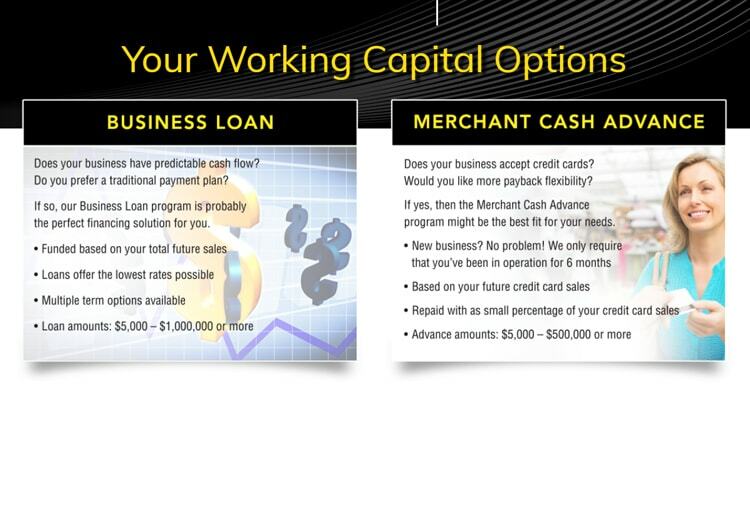 Small businesses just starting out have access to as much as $500,000 through merchant cash advances. Depending on your needs and your desired payment structure, either of these loan types can bring in essential funding when your business needs it most. If for some reason your company doesn’t qualify for a loan, the lender may get in contact with additional providers to try and find appropriate funding. This is optional, and you’re not required to give them permission to share your information with other companies. However, it can help expand your options in an emergency situation. Requirements are simple during the initial application process, but the website doesn’t provide any information on whether Wells Fargo asks for more details once you decide to accept the terms and rates of a proposed loan. In general, Leaders Funding asks for less documentation than a traditional lender, and both the application and approval are much faster. If you enter into a loan agreement with this lender, you should receive the money you need within four days. This quick turnaround time could mean the difference between taking advantage of or losing an important opportunity, or it could save your business in an emergency. Rates and terms for loans from Leaders Funding are determined when the company assesses your application. No figures are stated on the website, but the alternative lender aims to find the lowest fees possible. The amount you end up paying per month or per credit card transaction depends on your qualifications. If you accept a business loan, payment is handled in the same way as a loan from a bank. Each month, you pay a set amount toward the principal of the loan plus interest. The loan is paid off in full by the end of the term. The lender doesn’t specify if additional fees are charged for early payment, missed payments, or late payments. You’re required to provide monthly sales information in the application, and these numbers can help you determine your payment budget. Merchant cash advances tend to have higher interest rates than business loans, but your financial standing can affect the final rate. In some instances, it may be more beneficial for your business to choose a faster and more flexible financing option at a higher rate than to be locked into paying back a large loan for a lengthy period of time. The financial services provided by Leaders Funding are part of the larger Leaders Merchant Services company, so the home page functions more like a landing page. A phone number is the only contact information listed on the main site. More contact options, including an online form and live chat, are available on the Leaders Merchant Services website. This separate site can be reached via a link near the bottom of the home page. Without a main email address, FAQ page, blog, or similar resources, Leaders Funding lacks the more robust help and support systems offered by other lenders. This means it might be difficult to find answers to your questions before or during the application process. However, since it’s possible to apply by phone, you can speak directly with a staff member if you need guidance or wish to address any concerns. Whether your company needs a structured business loan to cover big expenses or a smaller influx of cash to handle routine payments, Leaders Funding may be able to get you financing with affordable terms and rates. Applying for a standard business loan or merchant cash advance is quick, and it only takes two days to find out if you’re approved. Leaders Funding doesn’t require a minimum credit score or a lot of paperwork from businesses applying for loans, and they work with Wells Fargo to get the right funding for every company. Eligibility is determined using simple personal and business information. Once you decide on a loan, Leaders Funding acts as a go-between to help handle the process and make your experience as smooth as possible. Leaders Funding was founded in 2000 as part of Leaders Merchant Services, a company providing credit card processing services to businesses across the U.S. Located in Camarillo, CA, this alternative lender is a registered ISO of Wells Fargo and uses the bank to provide loans and cash advances to customers. Leaders Funding attempts to find the most favorable terms and loan rates for every business without putting heavy emphasis on credit scores. With their two distinct services, the company is able to provide fast cash for many different business needs and can help companies secure funds using a simple application process.